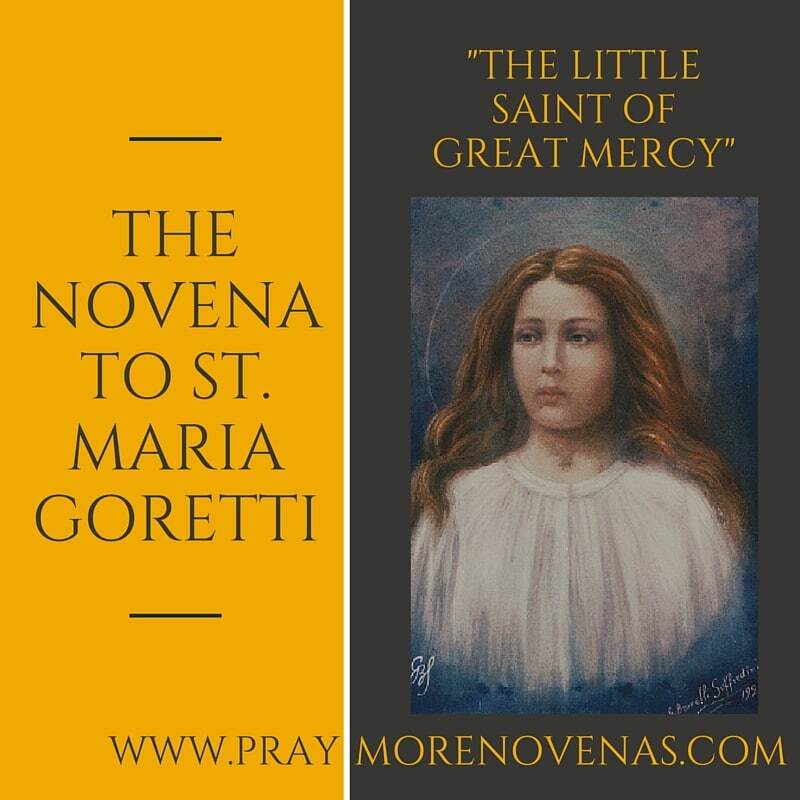 Here’s Day 2 of the St. Maria Goretti Novena! Please Lord help my parents. Please let their farm be successful and abundant. May the new clinic have many more patients and help all who live in the community. Keep my parents safe and in good health and their spirits up. May I some day have the means to make them proud of me. Please help my boyfriends business to grow. Please encourage and inspire him. May he be successful in all he does. Help me to find a job that fulfills me and enables me to support myself and my family. Please Lord, rid me of all my worries and anxieties of the future. In your beloved sons name I pray, Amen. To love our enemies, to love those that have hurt us, that I pray that like St Maria Goretti I may have: the Sacred Christ-like ability to love my enemies. Not just some, but all. Intercede for me, teach me. I pray for my son to be blessed with wisdom in making decisions for his housing problems. That we can all communicate respectfully . That he can afford to move in a house and find peace and happiness in his life. Please lord may his star start shinning for him at last and that he will be blessed with a good wife and happy children. Help my husband and give him courage to keep working . Guide him to better pathways . I ask for the help and prayers that my entire family needs. I pray for their protection and for our Lord to always be in their hearts and minds. Especially in their time of need and comfort. I pray for strength in myself to help me to be strong for them as well as myself. Prayers for my family, especially for the ones that don’t know Christ our Savior. That they be inspired to come to Christ, and give their hearts to Him. I pray for our cousin who is dying. That he have a peaceful and happy death. And suffers no more like he is now. I ask this through Christ our Lord, amen. Dear St. Maria Goretti please pray that I will get a good job where I can use my skills and talents, find happiness and financial security as well as peace of mind and of heart very soon. Please pray for my sons well-being; physically, spiritually and emotionally. That he grow in self-confidence and happiness. Please pray that I may be able to forgive those who have hurt me and forget the wrongs they have done. Help me St. Maria to know the Lord as you did. I pray for Your guidance in Loving the Lord and Loving my neighbor like You. I pray that my son Daniel is guided by Your light and Holy Spirit to love unconditional. That of himself, and of me, his Mom. I pray that we find a Peaceful channel with your help & God, to communicate in a respectful manor to each other. Please hear my prayers for today. LORD…St.Goretti, St. Dymphna thank for this day my daughter has good day in school, she was able to adjust with her studies. Praying that she will always have a good day…Thank you for this novena. May your wishes come true & your son will meet his future wife in his church. Amen. Lord I place my financial needs into your hands. Lord today I pray for financial deliverance. Amen…I too place my needs in the hands of our Lord. I pray too for financial deliverance. We pray through his loving mother, Mary in Jesus’ holy name. Almighty God, I thank you for have saved my life from the hands of armed robbers who snatched my car and I pray for mercy of God upon their lives and for them to repent. I pray to God to help me recover the car. My father, my Lord, provide for my husband a good job and financial upliftment for the family. Through Christ our Lord…. Amen!